Book blurb: Written in the form of a diary, which genre was so popular in the 18th century and which sounds so comprehensible in our time of blogging/webdiaries/webjournals, the novella may be called a love story. A story of a sixteen-year-old damsel and her weird marriage. Time: 1764, a year after the Seven Years War. Europe. 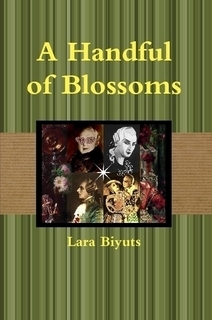 Larisa Biyuts is a Facebook ‘friend,’ and as I was reading her novella A Handful of Blossoms, [Lara Biyuts; 2 edition, January 2, 2014] I could vision many of the interests that Larisa holds dear—history, fine art, classic times, etc—and which are reflected in her writing. A Handful of Blossoms is set at the height of the Empire Period (1764), just a couple of decades before the French Revolution. Constance Otilia Alexandrine is a minor princess (which is to say, she is a ‘pawn’ in the imperial scheme of things), arranged in marriage to Constantine Leopold, Prince of Askanier-Hortz. Prince Constantine is himself a pawn of sorts, for tradition decrees that he marry and produce an heir, when, in fact, he prefers men—and makes no bones about it to his newly acquired wife. This perplexes her, but it also gives her time to explore the lush countryside, and the rich folklore of Transylvania, while fulfilling (…at the prince’s suggestion) her ‘womanly needs’ with the prince’s steward. This is where the story really takes off in a tapestry of colourful folktales and fantasies, masterfully presented in a vivid, and at times, poetic prose reminiscent of the times. It will be a delight to those who enjoy a period novel written in a period style. My one small quibble is that, here and there, there are minor idiomatic differences in the translation, i.e. “Milord might talk to me.” might have been better stated as “Might m’lord speak to me?” However, when you remember that English is not the author’s first language, these are easily passed over. Overall it is unique, both in time and location; different, inasmuch as it is a woman-character’s point of view of a gay situation; and, with the exception of the above, it is masterfully written. Four and one-half bees.